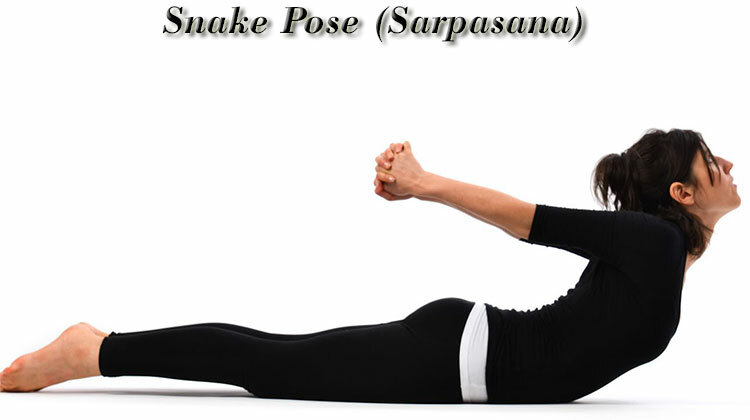 In Sanskrit “Sarpa” means “Snake”, “Asana” means “pose”. The English name is “Snake pose”. Interlock the fingers and place the hands on top of the buttocks. Place the chin on the floor. This is the starting position. Inhale deeply and slowly. Using the lower back muscles, raise the chest as far as possible from the floor. Push the hands further back and raise the arms as high as possible. Imagine the arms are being pulled from behind. Raise the body as high as possible without straining. Retaining breath, squeeze the shoulder blades together and look forward. Exhaling, slowly return to the starting position and relax the whole body. Release the hands and relax the arms by the sides of the body. Turn the head to one side. This is one round. Perform up to 5 rounds. Spine muscles and arms, spine, abdomen, chest, shoulders. Stretches chest, lungs,shoulders and abdomen with increased influence on the chest than Bhujangasana. Heart is toned and strengthend by the massage it receives due to the increased pressure within the chest cavity. In the final position the body weight is supported on the abdomen, pushing the diaphragam towards the chest. This, in turn, pressurizes the air within the lungs and helps to open out inactive alveoli, improving both the removal of carbon dioxide and the intake of oxygen. Helps to relieve blocked emotions. Tones the liver, making it beneficial for those with a sluggish liver. People with heart conditions and high blood pressure should take care not to strain while performing this asana.